“I want to fall in love with you.” That is the kind of phrase that we hear this time of year as dates are scheduled and chocolates and flowers are exchanged. When I think of that phrase I am reminded of the refrain from the song “Love Song for a Savior” by Jars of Clay. For the hip young kids, just trust me that it was just about the coolest Christian pop song of the 1990s. The song takes the predictable idea of a love song between a couple and sets it between a person and God. In a romantic relationship we know how people express love to one another. Gifts, kind words, caring acts, loving touch are just a few. If we are lucky we get to see these acts played out in our lives and the lives of those around us. God does want us to fall in love with him. We can see this in the parable of the prodigal son. When the selfish son returns home, the father treats him like the most important person in the world. Even though we might play the role of selfish son or daughter some times, God loves us recklessly, in ways that we probably think are foolish. God wants us to fall in love with him as much as he already loves us. While I believe the farm is a special place that God reveals his love, he is there with us every day as well. It is a good reminder for us to ask that special question “Where have I seen God today? Where have I seen God this week?” If we can pay attention, I believe we can see the ways that God is courting us to fall deeper and deeper in love with him. At the farm we often talk about the four cornerstones that guide this community: prayer, service, community, and simplicity. As someone who has been with this community for just about a year now, I would say though that the essence of this community, our starting point, is love and care for God and others. This work of love begins with the call that I would like to think all of our volunteers and staff feel on some level—the call to go out from our daily lives and our own communities to do service among the people of Appalachia. This love grows as our volunteers work with the homeowners who invite us into their homes to do home repair. It deepens as we pray and worship together, looking for the divine in all that we do. It takes root in the simplicity of our environmentally conscious lifestyle that calls us to turn off lights, conserve water, recycle, compost, and spend time in nature. It increases as we live together in community on a retreat that is often lighthearted and a lot of fun, but also a time when deep connections and friendships can be made. 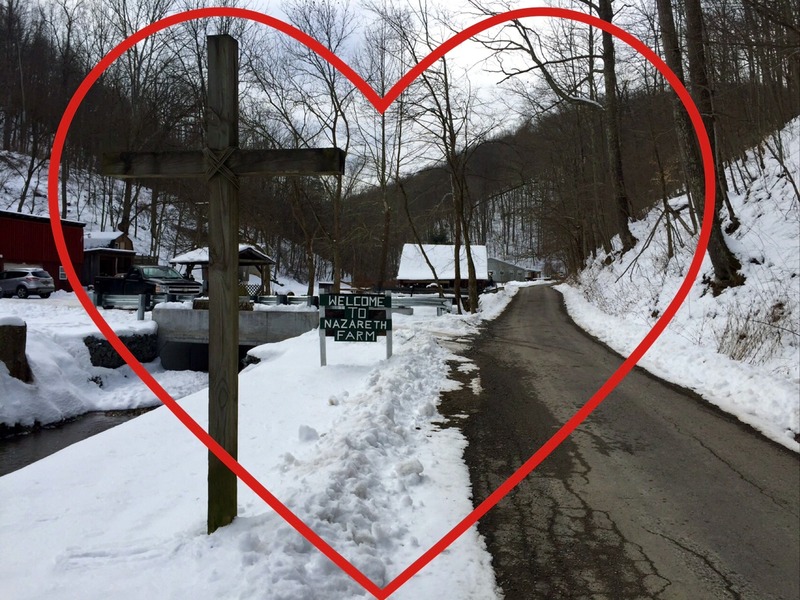 This love, in all of its dimensions, can help us find new meaning in our own lives and also give us the desire to better know the people here in Appalachia. This work of love gives us the desire to work for justice, too. This is because ultimately we must ask the question, “How can we love someone and treat her or him unjustly?” At the end of each retreat week I always hope that our volunteers have learned something about the need to respect the dignity of all people, and everything that implies. I hope they continue to ask questions about issues of justice and discover what justice looks like in their own communities. I hope they continue to care for and conserve God’s creation, which they experienced in all its beauty during their week here in the mountains. I hope they continue to live in solidarity with people here in Appalachia and maybe return someday. Love and justice meet in a special way at Nazareth Farm, and I hope that this community continues to grow in both. But wait, LOVE! how did they recognize it? OH, and there was these smiles with teary eyes! !